Food addiction and binge eating will expand your waistline. Food addiction and compulsions are a terrible thing for a slim waistline. I have been addicted to food nearly my whole life. It started when my mother and stepfather would go to the store. I would eat anything and everything in sight. In college, I would hoard food I liked because I felt that they might fun out at the store. Heck, I remember the diet candy my mom would buy. They were these little thinks call AYDS. These little caramel candies were supposed to suppress your appetite, but they did not do much for me as a teen. When they left home, I would snack all day long on just about everything from snack cakes to cheese that I would dip in mustard. I would binge myself on just about anything I could find to eat, but the worst ones were the cakes, cookies, and candies because I felt like I could not stop. I am a food addict. This acknowledgment is not a new revelation. I have known this for years. My love affair with food started as a child when my parents would leave me at home, and I will fill my day loneliness with my best friends: sugar and carbohydrates. It started with toasted cheese, cookies, cakes, and candy. In college, I found cheesecake and should have 2-3 slices a week. I would binge, and then I would swear it off for a few months in the name of healthy and an attempt to reduce my waist. Then I joined the Army and would have the twice-annual required pure to make weight and pass a physical fitness test. I acknowledge my problem today, and I am finally fed up with my rocky road, and I am making a change. Today, I plan to start fresh by pledging myself to eat better. Each day should be treated as a brand new start. Do not look to the past and you failures where you turned to the comfort food you are compelled to eat during a time of stress. Rather, each new day is an opportunity for success and to avoid those foods that lead to binges. I spent some time this morning thinking about how I was going to spend my life. I am tired of wasting my days in a sugar hangover after eating horribly. Today, I vow to cut most added sugar from my diet. Sugar is the true addiction, and I truly love it. Like me, you should pick you vice and vow to cut back. Plan a method to prevent or lower your odds of buying and eating these little vices. Most importantly, each day by planning more meals for the week and this will help you prevent that dreaded end of the day decision making when you have already spent all the decision energy for that day at work. Planning and sticking to the plan will prevent decision fatigue from leading to grazing or eating out. We all know that grazing and eating out less is one key to successful weight loss and maintenance. Binge eating disorder, and food addiction are very similar. It is important to note that binge eating disorder is a classified and diagnosable behavioral health or mental illness. Binge eating is often a result of the combination of biological, emotional, environmental, and psychosocial factors. As you see, a person who is dealing with binge eating often does so as a result of many interrelating complex causes and not a single one. Food addiction is tied to a particular food such as sugar. Food addiction is more biochemical in nature, creating a dependency on a physical or psychological reaction resulting from the consumption of certain foods. If you go without food, you will likely have symptoms similar to withdrawal. With these two food-related issues, professional treatment is often necessary for intervention and help. In particular, binge eating disorder can be life-threatening. If you think you may be struggling with food addiction or binge eating disorder, please consider reaching out to a professional. Personally, I think the first step to the start of a new change is to preplan your work, and that starts with a good breakfast. I have found that if I exercise or hit the snooze button a few times that I become strapped for time. I then either skip breakfast or eat on the go with foods of convenience. Instead of the mad dash to work with a bagel or doughnut in your mouth, plan your meals ahead. A good day, in my opinion, starts with a healthy breakfast at home. I try to prep my smoothies and oatmeals the night before by cutting them up and putting them in a smoothie cup or jar. Planning and prepping will help you increase your odds of eating the right foods and avoiding the mindless eating on the go or turning to your vice. Eating right at the start will help you better deal with the stress of the day. Unhealthy eating will lead to regrets, anger, and increased stress caused by your poor decision. Less stress will help you make better meal choices the rest of the day. If only food prepping was as addictive as the sugar buzz, then sticking to your diet would be easy. If I could get the same euphoria from making a healthy meal as I get to form a pound of jelly beans or a gallon of ice cream, I would always eat healthily. I really wish I could get addicted to healthier eating and exercise. I know you can become addicted to exercising regularly, but it takes hours of exercise regularly to get the same endorphin levels like sugar. I do eat well and stay active most of the time, and I have yet to have that same rush as a pint of Ben and Jerry’s. Eating disorders can take many forms, and they include Anorexia, Avoidant Restrictive Food Intake Disorder, Binge Eating Disorder, Bulimia Nervosa, Compulsive Exercise, Orthorexia, Pica, Rumination Disorder, and Unspecified Feeding or Eating Disorder. Binge eating disorder, in medicine, is the most common eating disorder and is defined as a severe, life-threatening, and treatable eating disorder characterized by recurrent episodes of eating large quantities of food and is often very quickly and to the point of discomfort. People often have a feeling of a loss of control during the binge and experiencing shame, distress, or guilt afterward. Although they do not regularly use unhealthy compensatory purging to counter the binge eating, they may go on strict diets. I think it is underdiagnosed and that there is an addictive nature to the disorder. Like binge eaters, food addicts are obsessed with food, body size, and weight. I personally think that they a part of the same illness. After a stressful day at work, you may choose to hit a drive-thru and eat a supersized meal and a milkshake. Planning and prepping instead can help you avoid the temptation. The decision is made for you. It does not have to involve a lot of cooking either. You can simply save leftovers from prior meals or event a doggie bag full of those leftovers from the work lunch that you brought with you from home with you. After a chaotic afternoon, you stop by Starbucks for a piece of cheesecake and frozen coffee drink? Do you feel the unconscious urge to put your finger into the icing on the dozen cupcakes you bought for a party at work? Many people spend their days thinking about when and what we are going to eat or not eat. I am not saying that you should stop eating because all food is addictive. That type of commend is crazy. You can’t stop eating. Eating is how we keep functioning and without food, we would die. What I am saying is that if you cannot stop at one serving of cheesecake, you might have a problem. There are organizations out there for you. Food Addicts in Recovery Anonymous offers support. They might be able to assist with relief from the symptoms of eating disorders and guidance on living in recovery. You can also seek the help of a behavioral health provider. Eating fast. You eat much faster than most around you and are the first on in line to get seconds. Difficulty eating in moderation. Can you stop at one doughnut or does the second and third talk you into to more. One piece of chocolate is fine, but you continue to graze on it until you are sick. Eating alone. Are you embarrassed eating in crowds. Do you avoid eating when others are watching? Excuse making. Do you have an inner voice sabotaging your success? You give up sugar or flour to improve your health, but use a friends birthday as an excuse to have ice cream or cake. Indulgence leads to guilt, and you spin out of control. Food cravings. Do you have intense desires for certain foods such as sugar or pasta? You feel a complete inability to stop eating them and often overeat them. Food hiding or sneaking. Do you hide or hoard food? If you have that hidden stache of Twinkies or Reese’s Cups, you might have a food addiction or binge eating disorder. Hiding food from others or hoarding it might be a sign of an obsession with a particular food and is a common sign of food addiction. Binge eaters will often sneak into the kitchen at night for a snack. Depression, guilt, regret, and shame. Do you often feel these emotions after eating? Intense feelings of guilt and regret after meals is a red flag for addition or binge eating disorder. Eating to discomfort. Do you eat past the point of fullness regularly? I am not talking Thanksgiving meals. I am referring to eating more even after you should be full and often you may not get the feeling of being full until you reach the point of reflux or discomfort. Overeating occurs because the cravings they feel have nothing to do with hunger and are sent by the brain and not by the need for nourishment. If you are the Energizer Bunny of eating and keep eating and eating to the point of pain, you need to seek help. Eat despite health ramifications. Addicts continue to drink even though they have liver disease. Like the alcohol-dependent subject, food addicts will continue to overeat and fall for cravings even when they are told that their weight and eating is adversely affecting their heart, blood pressure, or blood sugar. They will continue to eat sugar and carbohydrates even after being counseled by their medical provider. “All or nothing” mentality. If you mess up, you give up and say that tomorrow is another day. If you feel regret of the slip-up and it sends you into another binge, you might have symptoms consistent with binge eating disorder. Food addicts, like drug addicts, have an “all or nothing” mentality when it comes to eating, which means if they take home a chocolate cake, they will likely eat most of it until they are sick. Eating to soothe the pain. Eating disorder suffers often use food as a medication for the physical and emotional pains they experience. I personally feel I have an addiction to sugar and flour and tend to binge when I eat these foods. This majes sense since sugar and flour have been shown to release endorphins when ingested. I only have a few traits of binge eating disorder and have discovered which foods I need to avoid. I am more successful at maintaining a healthy diet if I plan around those foods and schedule my meals with recipes ahead of time. Deciding when I am hungry is a recipe for disaster. The bottom line: Food can be addictive. Sugar and flour have been shown to release addictive endorphins. Plan ahead and prep your foods and you will be more successful. It is much easier to maintain a healthy lifestyle if you have a plan and avoid snap decisions. 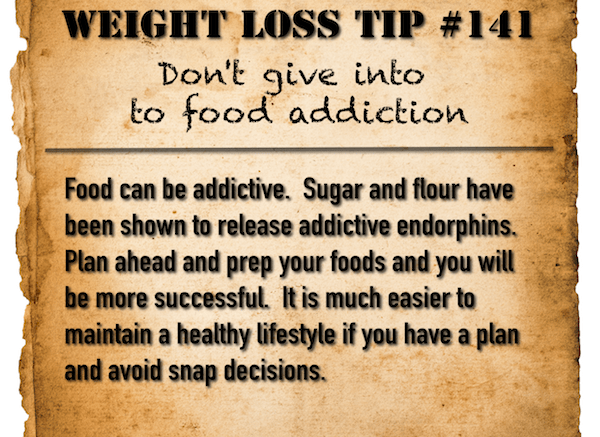 If you find yourself binging regularly (once a month or more often) and you are unable to stop, you may have a food addiction. Stop setting yourself up for failure and going to bed feeling weak, ashamed, and guilty about another failed diet attempt. Be the first to comment on "Weight loss tip: Don’t give into to food addiction"